One of my all time favorite candies is M&M’s. When Clark and I got married some 19 years ago this June, we used pastel colored Peanut M&M’s in little tulle packages tied with ribbon as wedding favors. Clark’s young cousins thought they were great to throw at us when we ran from the church to our awaiting get away car but hopefully our other guests ate them. Now, you’re wondering by now, I’m sure, what the heck does this have to do with Unicoi Preserves? M&M/Mars is a huge company, with a lot of people working all facets of the company, to include product research, consumer testing, marketing. Basically, the polar opposite of Unicoi Preserves. Do you recall, back in the 90’s, Plain M&M’s became Milk Chocolate M&M’s? How much consumer research did it take for that to happen? Why did the change come about? Were people just not buying Plain M&M’s? Milk Chocolate was exciting, Plain was boring? with two products, Georgia Apple Cider Pepper Spread, which became a 2015 Flavor of Georgia Finalist. Our other product, Georgia Chambourcin Spread, highlights one of our favorite wine grape varietials that are grown here in White county. We think its a great way to showcase our Unicoi Wine Trail by making products from local ingredients like Chambourcin grape juice. Elvis presents, Georgia Vineyard Spread! Georgia Chambourcin by another name, still as sweet! However, doing product demo and talking to people, we have found people have a hard time saying Chambourcin and understanding what it is. So with that being said, may I introduce to you, Georgia Vineyard Spread. Its the same Georgia Chambourcin Spread that you know and love, simply renamed. We are not pulling Georgia Chambourcin Spread and sending it to Big Lots, so there will be a transition period and you will see both labels on the market for a short time. 24 Feb Flavor of Georgia – We’re a Finalist! Excuse me while I gush…. Our Georgia Apple Cider Pepper Spread is a Finalist in the Flavor of Georgia contest! We will be going to “The City”, aka Atlanta, on March 9th to present our product to a panel of judges for tasting and evaluation. Then, on Tuesday, March 10th as part of Gov. Nathan Deal’s Ag Awareness Day, we’ll be set up doing product demo to the public from 10 am til noon at the Georgia Freight Depot. This is a great opportunity for us and we would love if you would come out Tuesday and see us and the other great Georgia food products that are in the contest. Winners will be announced on the afternoon of March 10th, so stay tuned. We are so flattered to be in the finals and really appreciate all your support, encouragement, kind words, recipe ideas and parting with your hard-earned money to buy our low sugar, locally sourced, all natural spreads. We couldn’t have done it without you! This blog post is long past due. Its not about Unicoi Preserves or a recipe, but a blog post about our family. We’re two people and we share our home with some retired racing greyhounds. That number of greyhounds went from three to two on December 19th. We lost our Bonnie after a 5 day stay in the veterinary teaching hospital at University of Georgia. It was unexpected and the little things that we were attributing to her aging wound up to be cancer. Bonnie was with us for over 10 years and she was the dog most likely to be stolen. Everyone who ever met her fell in love with her gentle nature. She was funny, and she demanded attention in a very quiet manner. If you were sitting by her and stopped petting her, she’d reach out her front paw, hit you with it, chattering and looking intently at you to will you to continue to pet her. Greyhounds are notorious for being snackers, but Bonnie was particular. She wouldn’t eat a crust off the piece of bread, you could forget giving her something like a piece of apple or a pretzel. Meat, now that was another story. When Clark grilled some meat, she immediately appeared. Roasting chicken or making chicken broth, she was there. Pizza night, oh yes, but not the crust, how about the cheesy part. Vanilla ice cream, yes. Ritz cracker, no. She was the last dog that we had from our life in south Georgia, so it is very bittersweet that we let her go on the anniversary of our move to Sautee. Outliving Joe and Chloe and accepting Colbie and Fox into her pack, and Betsy’s Hannah as well, she was an even tempered and tolerant greyhound. She was not an alpha dog by any means, but after her passing, Colbie and Fox both did some rallying to see who was in charge, so we steered them to the thinking that the humans are in charge. That is only partially true, some days we do better then others! Bonnie enjoyed good health her whole life, except for the last week of her life. Not many people can say that they lived their entire life that healthfully. Now that some time has passed, I can say that without as much water leaking from my eyes. Run free, sweet Bonnie. You were loved and you are missed. We will never forget you. Elvis would have turned 80 this past week so I created a sandwich in his honor using our Georgia Apple Cider Pepper Spread. Pre-heat your pan (this is my favorite for such cookery) on medium and assemble your sandwich. Not reinventing the wheel here, you know how to make a sandwich after all! Here’s how you make The Spicy Elvis. Spread peanut butter on one side of the bread, top peanut butter with sliced banana. On the other slice of bread, spread the Apple Cider Pepper Spread. Put the two pieces of bread together and generously spread softened butter on the top side. Put the sandwich, butter side down, in your pre-heated pan. After you put the sandwich in the pan, butter the top piece of bread. I kept the heat medium-low when I griddled it and recommend you do the same. Nobody wants to eat a hunk-a-hunk-a burned up sandwich. Burned sandwiches made Elvis sad. Keep an eye on it and flip your Elvis when it when its toasty. When both sides are golden brown and toasty, take it out of the pan, cut in half diagonally and serve with potato chips. This sandwich could be further Elvis-ized by adding some crispy slices of bacon to it. I was crunched for time when I made this sandwich but think the addition of bacon would make The King happy. Thank ya. Thank ya very much! 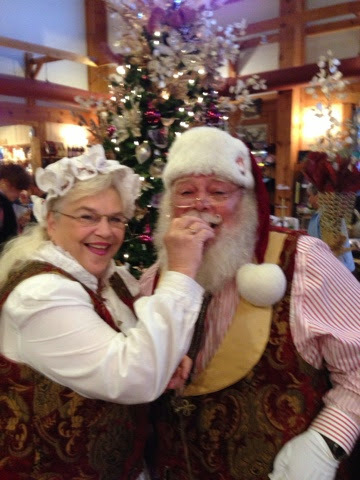 Santa and Mrs. Claus paid a visit to the Nacoochee Village on December 13th and we were fortunate enough to be at Habersham Winery when they showed up for Happy Hour. Chambourcin wine was poured for the adults and delicious S’mores from Hansel and Gretel Candy were enjoyed by the kids and adults alike. 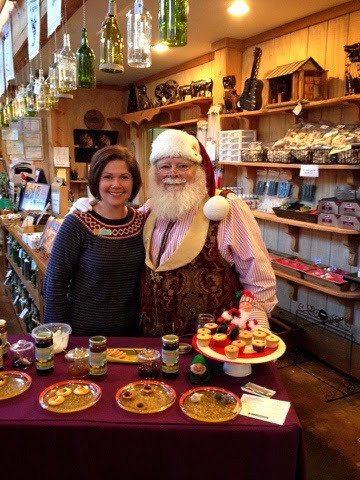 I always try to stay on Santa’s good side, and I know that he likes Unicoi Preserves a lot, so in addition to our usual product samples, we were also able to offer him some Santa Bellies and Georgia Vineyard Snowballs. With a smile and a nod, Santa and Mrs. Claus wished us a Merry Christmas and were gone. We hope that you and your family enjoyed a wonderful holiday season. Elsie gives Georgia Vineyard Snowballs the Thumbs Up! 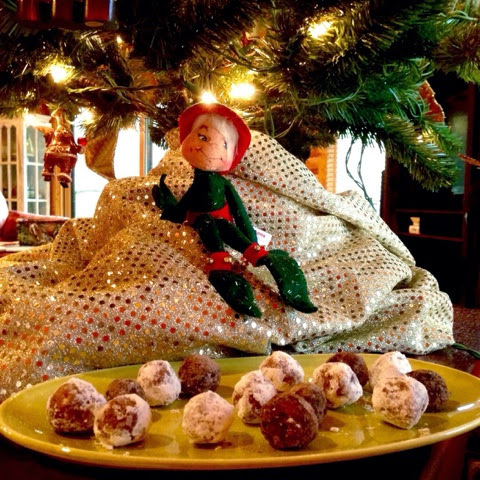 I just love Christmas time and boozy rum balls. They’re tasty, fast, easy, no bake and popular at holiday get-togethers. If you have little ones who would like to have an equally tasty treat, here’s a delicious, family-friendly recipe using our Georgia Chambourcin spread to create something similar to rum balls that the whole family can enjoy — no ID required! You can even get the kids to help you roll them. A food processor makes fast work of breaking down the nuts and the vanilla wafers. No food processor? No worries! You can buy finely ground almonds. To make vanilla wafer crumbs, put your wafers in a plastic zip bag and repeatedly whack them with a rolling pin or cast iron skillet until they are crushed finely. Don’t like or have almonds? Try pecans, walnuts or pistachios. To roast nuts, spread them on a sheet pan and bake at 350 degrees for 8 minutes. Don’t walk away, set your timer and keep an eye on them — burned nuts are sad nuts. Cool slightly, then pour the nuts into your food processor bowl and pulse them until they are finely ground. Don’t over do it or they will turn into almond butter, which is tasty, but not what you want for this recipe. In a mixing bowl, mix the ground almonds, vanilla wafer crumbs and 1/2 cup powered sugar until evenly incorporated. Measure your Chambourcin spread into a glass custard cup and microwave for approx. 30 seconds, watching it the entire time. What you are doing is turning the spread into liquid. Give it a stir, then mix it into the almond-wafer mixture until its incorporated. It will be sticky so refrigerate it for about an hour, then pull it back out to form your Vineyard Snowballs. Looks like meatloaf but its not! I use a small cookie scoop to measure out similar size balls but if you don’t have on, just use a teaspoon to measure it out and roll it into balls. After you get the dough rolled into balls, roll them in powdered sugar. Friday, we had a busy day with product demo at The Lavender Cottage and Garden but we were looking forward to Serenity Cellars Friday Night Wine Down. I wanted to take an appetizer featuring our jelly that would pair well with wine but didn’t have a lot of time to spend making something. Pepperidge Farm Puff Pastry Wrapped Brie to the rescue! I followed this recipe Puff Pastry Wrapped Brie on the Pepperidge Farm website but to make it my own, here’s what I did. It was delicious served with ginger snaps. Lots of variations for this basic recipe for sure. With this being the start of the holiday season, I foresee wrapping another wheel of brie with puff pastry and using our Georgia Vineyard Fire and salted pistachios. Please let me know if you make it and if you adapt it at all. 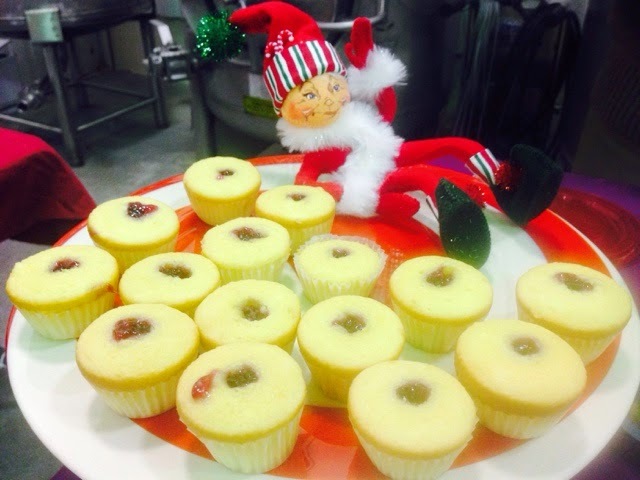 We participated in A Taste of the Holidays at Habersham Winery this past Saturday and this was one of the tasty treats we had for the sampling at our table. I called them Santa Bellies in ode to the classic Christmas poem ‘Twas the Night before Christmas. Preheat oven as directed on the box, then prepare cake batter, also as directed on the box. I added a teaspoon of vanilla extract to boost the flavor but you can skip this if you like. Put the cupcake liners in your pan and fill 3/4 ways full. I used a small cookie scoop I had to fill the cupcake liners. Bake until the cakes spring back or toothpick inserted in the middle comes out clean, Mine took 12 minutes. Cool on rack & repeat with remaining cake batter. Mine made 48 bites, this could vary on how full you fill the pans and how drippy you are when filling them. Using the blunt end of the chopstick, poke a hole in the cupcake but not all the way to the bottom & wiggle it to make room for the Chamboucin Spread. Spoon the jelly into your pastry bag or plastic bag & shoot each bite with jelly so some shows through the top. These really stay nice and moist thanks to the jelly center. PS If you’ve been following us for a while, you may recognize these cupcakes from Halloween. They’re the same recipe as Vampire Bites 😉 The name has been changed to reflect the season! Peanut butter and jelly sandwiches, a fond childhood memory for many. What if we took that same basic idea and adapted it into spicy chicken wings? This recipe may sound a bit wacky, but it works and its delicious! And heads up, vegetarian friends, this also works with tofu! Will you be my Bud, Mr. Potato? Preheat oven to 425 degrees. Our oven has a convection roast feature, if you have that as well, now is a good time to use it. Line a sheet pan with aluminum foil or use a Silpat to avoid scrubbing later. Spray a baking rack with non-stick spray and put it on the sheet pan. Toss the wings with the oil, sprinkle with salt, pepper, cayenne and the mashed potato flakes. Roast for 30 minutes, take out and turn them over, roasting for another 25 minutes. This time may vary depending on how big your wings are and how hot your oven is. While the wings are roasting, prepare the sauce. While your wings are roasting, mix up your sauce. Put all the sauce ingredients in a microwave safe measuring cup or bowl and microwave it for 20-30 seconds to get the peanut butter and jelly a bit more mixable. Whisk together. When the wings are done, toss them with the sauce and put them back ion the rack on the sheet pan and into the oven for 5-10 minutes to caramelize. This is not the time to walk away, they can burn pretty quickly. Really, no more beer for you if you think this is blurry! When they are caramelized, take them out and if you like your wings swimming like we do, toss them again in the sauce and serve. Clark and I have been looking forward to vending at the event at Hardman Farm since it was announced by the White County Chamber of Commerce. A wine festival featuring all our favorite wines from the Unicoi Wine Trail that’s close to home? Sign us up! Knowing what an energetic and organized staff we have at our Chamber, we knew the festival would come off without a hitch. The one down side to the event was the unseasonable blast of cold air that came in Friday. But, there’s no way for anyone to ever predict the weather when planning an outside event, whether its held in April or November. The volunteers rallied together and the staff of Mountain Valley Community Bank even came around with hot coffee and donuts for us while we were setting up. Several years ago we were still living in south Georgia but were up at Brasstown Bald for the Tour de Georgia bicycle race, an event that was held in April, and the sunny weather soon disappeared and a cold front moved in, with snow and wind. Thinking I could buy something warm, we went down the mountain and into Hiawassee but all they had out in stores were summer clothes! A lady in one of the stores told me “Honey, the weather changes fast up here in these mountains!” That advice has stuck with me over 8 years now and I usually do have a hoodie tucked away if we’re heading north, regardless of the weather when we leave the house. But back to the Unicoi Wine Festival! We were fortunate to have the zippered sides up on our EZ-Up and be facing south, with the wind coming from the north, so we got the warm rays of the sun and by the end of the day had gathered a nice party of people warming themselves in our tent and enjoying their wine and Unicoi Preserves samples together. Our friend Sarah had stopped by to see us and not only helped with some customers but also restocked some spreads for us and gave the greyhounds an afternoon let out for us. We get by with a lot of help from our friends. We are looking forward to next year’s Unicoi Wine Festival and hope that you will come and tour Hardman Farm and the Unicoi Wine Trail soon.